Kolaches are a Texas breakfast treat that can be either savory, think sausage and cheese or sweet, usually with a fruit filling. 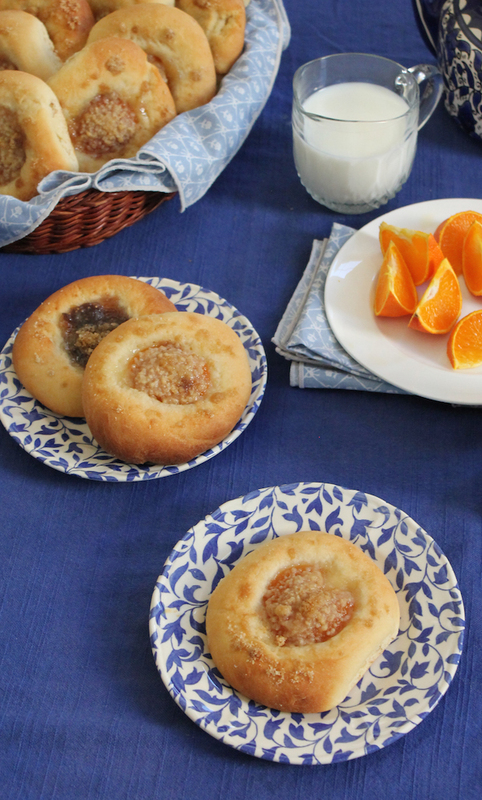 The filling in these apricot kolaches isn’t traditional but they are delicious. Houston has a homegrown doughnut chain called Shipley Do-Nuts, one location mere minutes from our house there. It’s a treat to go early in the morning and get a dozen of their hot glazed doughnuts, fresh out of the fryer. The place smells of sweet sugar and fresh coffee and since there’s no place to sit and eat, folks are lined up to place their orders to go. They even have a drive-through. This is Houston, after all. Everyone drives everywhere. And since it’s also Texas, Shipley's makes kolaches. My personal favorite is jalapeño sausage with cheese. Divine. So why are kolaches typical in Texas? There are many towns and rural areas where folks from Czechoslovakia came to settle during the mid- to late 19th century. Along with their devotion to the Catholic Church, strong work ethic and love of polka music, they brought their kolache making tradition. If you are ever headed to Texas, make sure to check the events calendar for a Czech Fest. Taking place in several towns, the fun starts on Labor Day weekend with the biggest, Westfest. While many of the Czech fests include a kolache baking contest, they all have polka bands and you will be required drink cold beer and get up and dance. It’s a rule. This month’s Bread Bakers challenge is to use stone fruit like cherries, peaches, nectarines, mangoes and the like. Problem is, except for mangoes, the stone fruit that is imported to Dubai never really smells or tastes of properly ripened summer fruit. 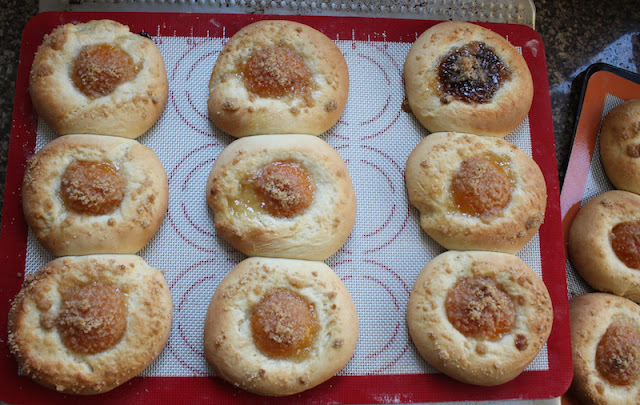 Traditional fruit kolaches have a cooked fruit filling in a sweetened yeast dough so I could have made do. After all, every fruit is sweet if you cook it down with sugar. I decided to use canned apricot halves and leave them whole instead. Just because I think they are pretty that way. The dough divides nicely into 18 pieces, but my can of apricots was short one half. No problem, I filled that final kolac (<that’s the singular) with some homemade preserves, in this case, fig. 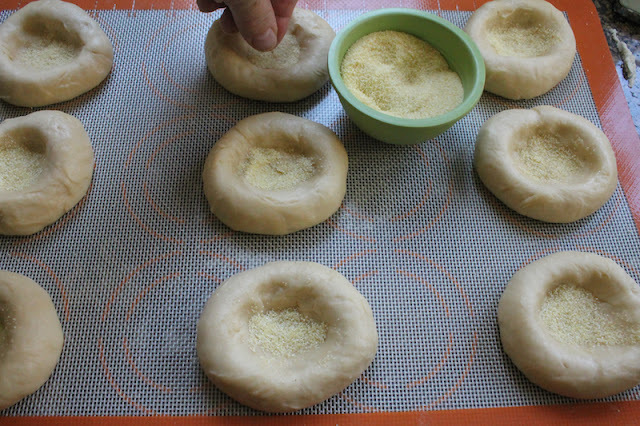 You could actually do the same with all of your kolaches if you can't be bothered to make filling. 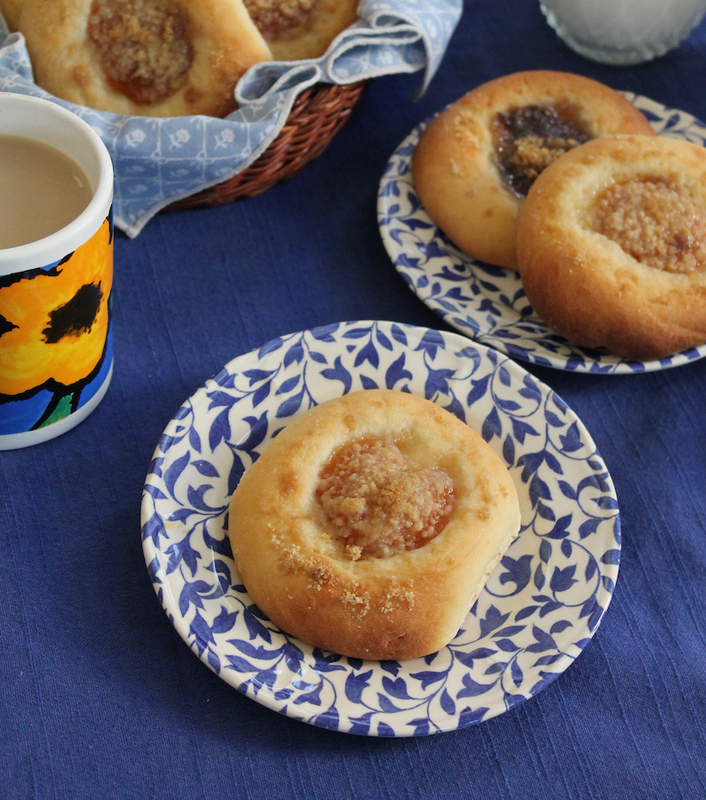 This recipe calls for chilling the dough in the refrigerator overnight so start one day ahead of when you’d like to serve these kolaches. This is ideal since then they can be fresh baked for breakfast. Take your eggs and sour cream out of the refrigerator and leave them to come to close to room temperature. Drain the apricot halves and put the syrup in a small pot. Lay the apricots out on some paper towels to dry. Cook the syrup with the sugar over a medium low heat until the liquid has reduced to about 1/3 cup. Add in the butter and salt and stir well. Add in the apricot halves and set aside to cool. Once cool, the syrup turns into a kind of jelly. 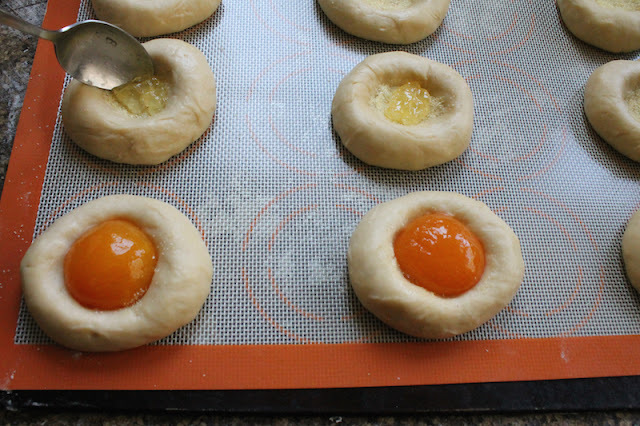 Refrigerate the apricots and jelly when the dough rests overnight. Put the yeast in a large mixing bowl, or the bowl of your stand mixer. Add 1 tablespoon from the sugar for the dough and the warm water. Leave to proof for a few minutes. 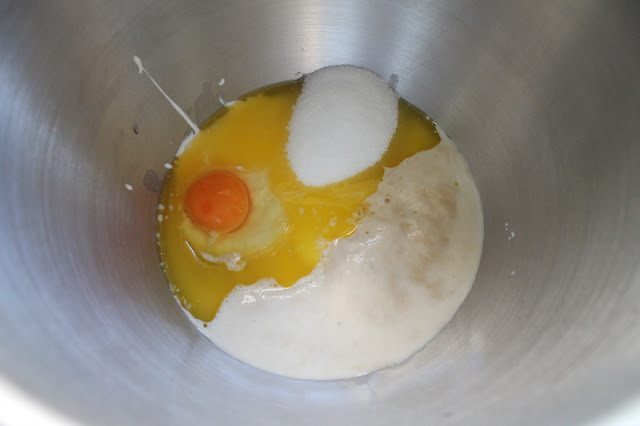 Add the butter, sour cream, egg, sugar and salt into the mixing bowl. Beat until well combined. Add in four cups or 385g of the bread flour and beat well. 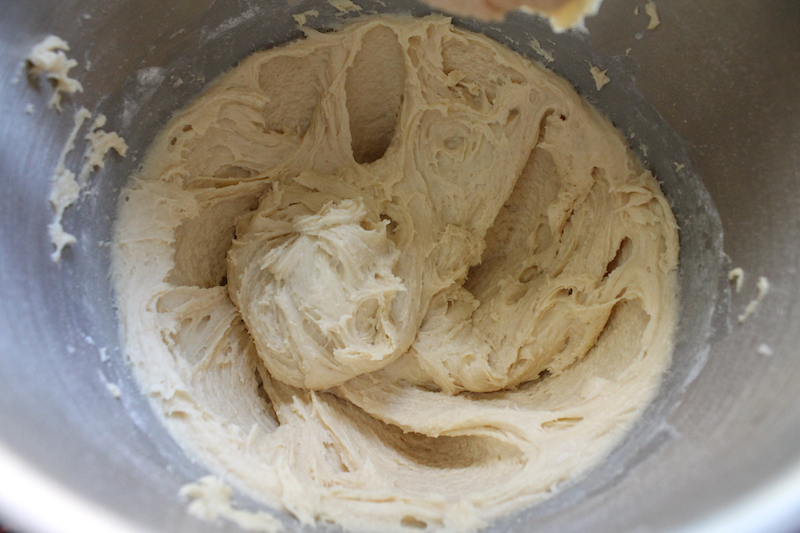 The dough will become quite thick but still very soft and sticky. 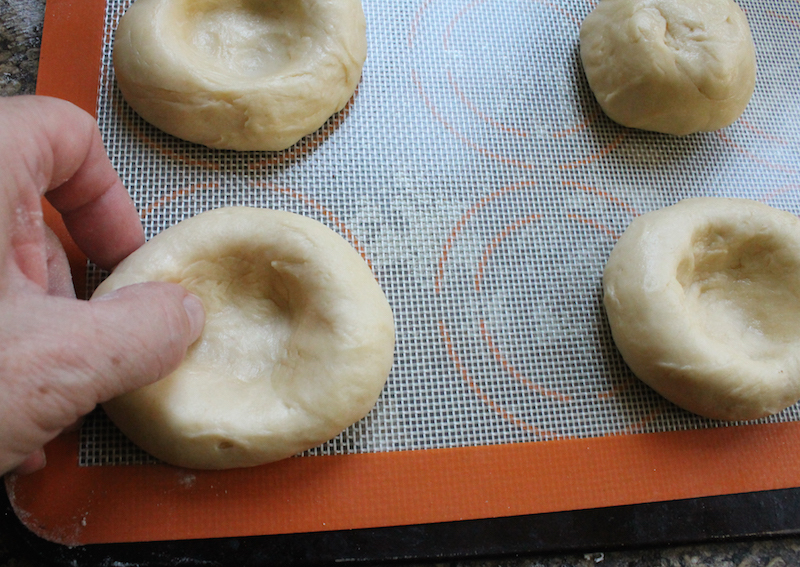 Use your bread hook to add in the last cup or 125g bread flour and knead for a few minutes. It's still going to be pretty soft and sticky but, fear not, it will be easy to handle once chilled. Put the dough into a buttered bowl, cover with cling film and pop it in the refrigerator. Let it rest overnight. 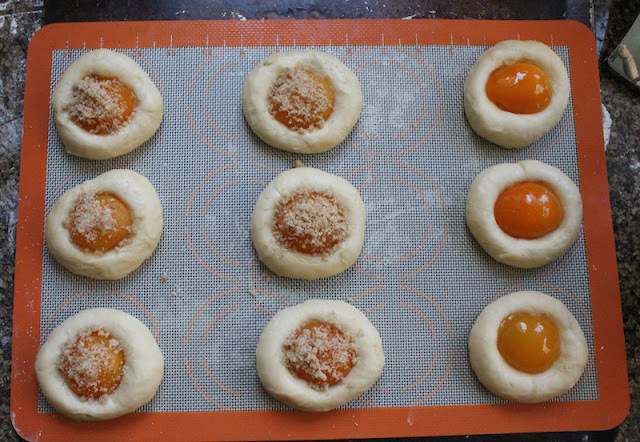 When you are ready to bake the next morning, take the apricots and dough out of the refrigerator. Cut the dough in half. Then cut each of those halves into three equal parts. Then divide the three parts into three more. 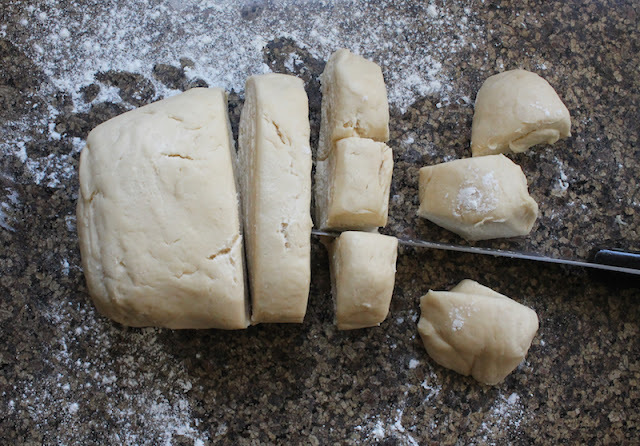 This should give you 18 reasonably equal pieces of dough. Line two baking sheets with parchment paper or silicone mats. 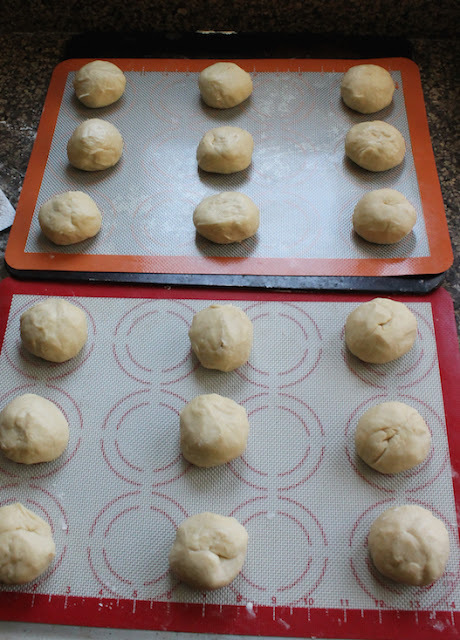 Roll the dough pieces into small balls and place them evenly spaced on the lined baking sheets. Cover the balls lightly with cling film and set in a warm, draft-free place to rest for 10 minutes. Use your fingers and thumbs to press out an indentation in the middle of each ball that’s large enough for your apricot halves. Sprinkle a healthy pinch of fine semolina – perhaps a 1/4 teaspoon – into each indentation. 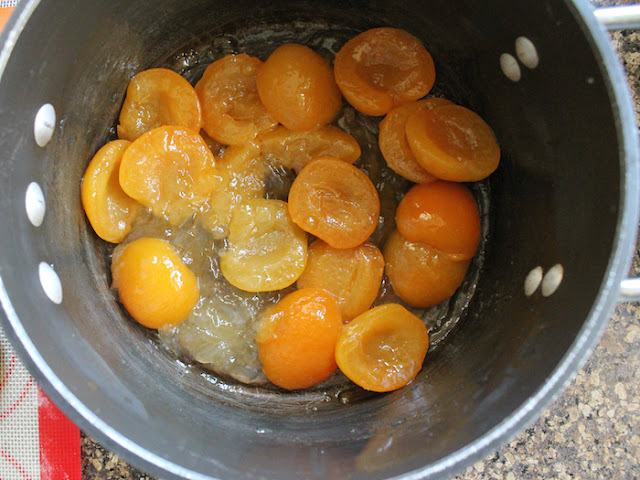 Add about 1/2-3/4 a teaspoon of the jellied apricot syrup into each as well. Tuck a half apricot in on top of the jelly. 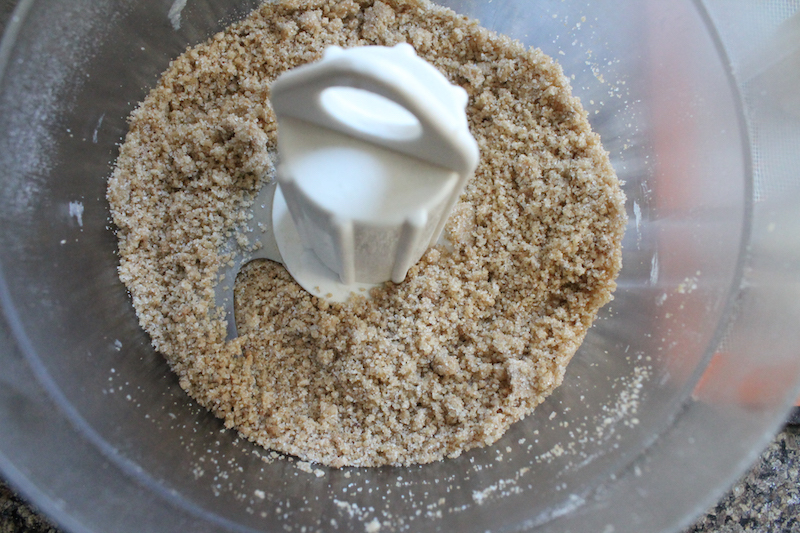 Combine the all-purpose flour, sugars and butter in a food processor and pulse until crumbly to make the crumble topping. Sprinkle the crumble liberally on top of the apricots. Set the pans in a warm, draft free place for about 30 minutes. When the resting time is almost up, preheat your oven to 350°F or 180°C. Bake the kolaches in your preheated oven for about 20-25 minutes or until they are golden brown. There's the fig preserves one, top right. Enjoy with a hot cup of coffee or tea. Polka music optional. 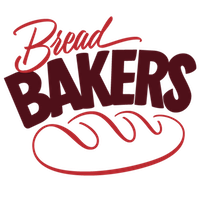 Many thanks to Mireille from The Schizo Chef for hosting Bread Bakers this month. 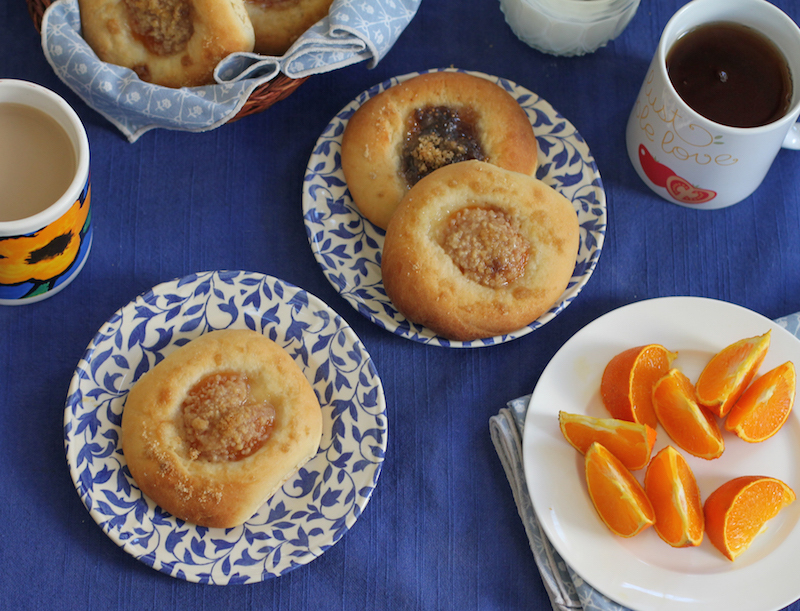 Are you ready to get baking with stone fruit? We’ve got plenty of great recipes for you!